(Courtney Joyner – The Daily Signal) A poll released Tuesday just ahead of the 46th March for Life demonstration in Washington, D.C, shows the majority of Americans support tighter restrictions on abortion, and would even like to see the landmark Roe v. Wade decision “reinterpreted” to allow more restrictions. The annual survey conducted by Marist in partnership with the Knights of Columbus, a Catholic fraternal organization, reveals that three-quarters of Americans oppose taxpayer funding for abortion abroad, even though 55 percent of Americans polled identify as pro-choice. Additionally, 75 percent of Americans—including those who identify as Republican (92 percent), Democrat (60 percent), and independent (78 percent)—said abortion should be limited to the first three months of pregnancy. 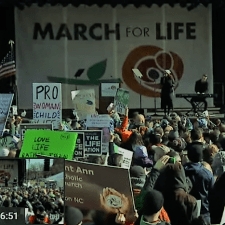 “As in past years, this poll shows that the pro-choice label on the abortion issue is simply insufficient,” said Knights of Columbus CEO Carl Anderson in a statement.